Use this exercise to visually map an activity across a series of dimensions. It is worth noting that the units these aspects are measured in may be different and therefore non-comparable. For each aspect, and on a scale of 1-10, decide where to place your activity. Use a coloured pen to plot your course on the spidergram. Use your judgement about what units of measurement to use, and don’t get too hung-up about accuracy! What you are aiming to produce is a snapshot of your activity. Who do you work with who might be interested in seeing this view? How useful might it be to compare your chart someone else's? What might this comparison tell you? 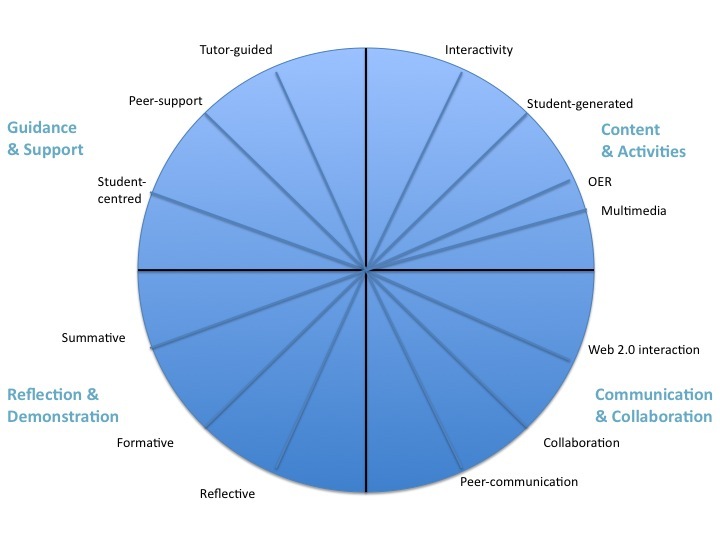 (For support professions) How might this graph help you talk to course teams about the services, advice, resources and tools you offer? Course dimensions blank. Download from SlideShare.